Londoners will have the opportunity to bag a ‘Bagelizza’ and save some dough, with the innovators giving away HUNDREDS of ‘Bagelizzas’ for FREE for one day only. 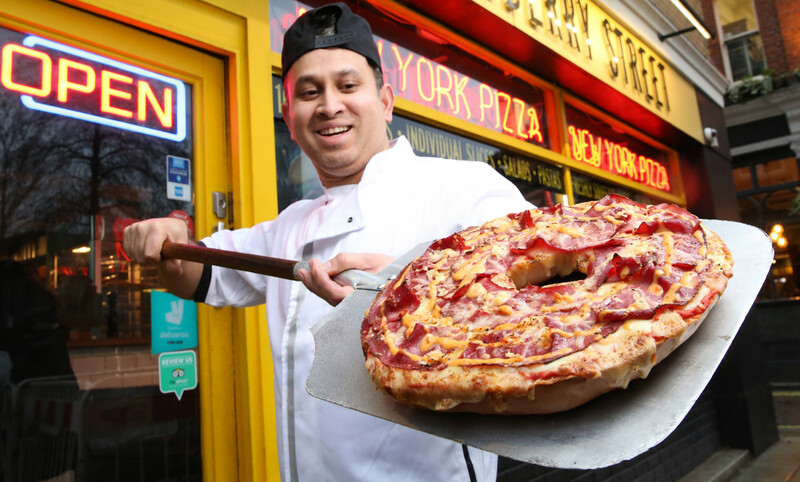 In recent years, the 9th of February has seen divided Brits face a dining dilemma: to celebrate National Bagel Day OR National Pizza Day? Boiled and baked the New York way, the 12-inch bake is made by hand by the expert bakers at New York Bakery Co. Each bagel weighs in at an impressive 1.5kg, which is more than 16 times heavier than the average bagel. Itgets sliced in half to form the base. Available on Saturday 9th February 2019 on a first come, first serve basis, the limited-edition ‘Bagelizza’ is available to order from Mulberry Street Pizzeria in-store or on Deliveroo from midday.